How do I register and/or setup for automated bank statement import (PS Bank Feeds) ? Practical Systems Automated Bank Statement Import is a simple and secure service that allows you to automatically import your bank transactions directly from your bank(s) into one or more of your Cashbook companies. This process will save you time and ensure complete data accuracy. It provides automatic data entry, while also allowing you to allocate or modify account coding, add or modify details, record bank transfers and even apply transactions to outstanding invoices. You can also find and match transactions you have already entered into Cashbook. If you wish to import from a bank not listed above, please contact Practical Systems and we will see if your bank can be included. Regional Australia Bank (previously credit union) not included as they want us to go through a different 3rd party (other than SISS). Each bank for which you require automated transaction import (what we call a Bank Feeds) requires individual set up. However, before any banks can be set up, you must register once for PS Data Feed, from within Cashbook, as detailed below. Click on the Setup > Bank Feed Setup menu option. Tick the Enable Bank Data Feeds box. Tick the Automate Bank Statement Import On Startup if you wish to be taken to Bank Feed Import window to view and import any new transactions, each time Cashbook starts. If you would like to specifiy a Default Expense Account, choose that account from the drop-down list. The default will only be used if an account is not automatically assigned for each transaction by linking to a customer or supplier that itself has a default account. This can speed up the import process a lot, but may require some account re-allocation after the import, depending on your required level of categorisation. If you would like to specifiy a Default Receipt Account, choose that account from the drop-down list. The default will only be used if an account is not automatically assigned for each transaction by linking to a customer or supplier that itself has a default account. Note the Manual Login button. You should never need to use this unless prompted by the Cashbook software, advised by Practical Systems staff, or if you have logged out of the PS Bank Feeds. click on this button to access this Practical Systems Knowledge Base article for help. ​Click on the Register tab. Fill in Details: First Name, Last Name, Email Address and Password. Click on the Register button. If all details are correct, you should receive the following message. If not, please contact Practical Systems. Please click on the link below, or copy the text in the link and paste it into the address bar of your browser. Now you can go ahead and set up your required Bank Data Feeds. See Step 3 below. At any point after the initial registration, you can change your name or email details and then click on the Update Details button. Note that if you change your email address, you will get another email confirmation request. This confirmation must be done before you will able to proceed with other Data Feed operations. At any point after the initial registration, you can change your password and then click on the Change Password button. If, at any point after the initial registration, you need to login manually and you have forgotten your password, just click on the Forgotten Password? link. You will then be sent an email with a link to the PS Datafeed webiste, where you can assign a new password. Click on the down arrow to Select a Bank (one of the banks listed in your Chart of Accounts). 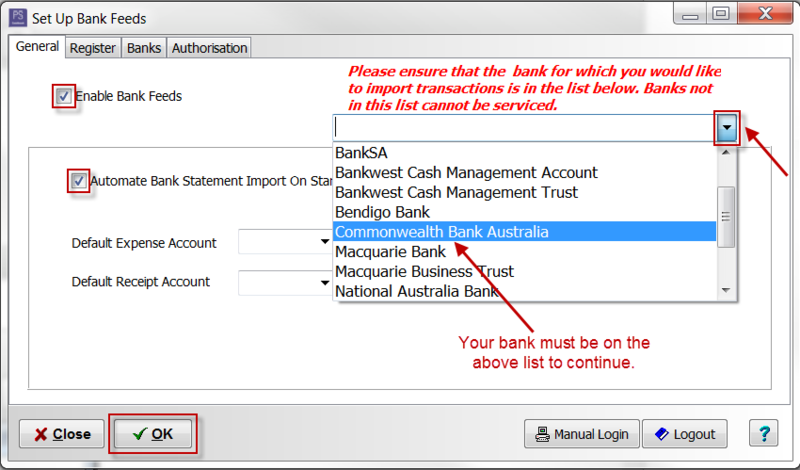 Enter the BSB and Account Number of the bank selected, if not alread displayed correctly. Click on the drop down arrow beside The selected bank is linked to window, to select the name of the bank your account is with. Click on the Enable Bankfeed button. Check to see you have an email/s from Practical Systems. Print off the Data Authority Form (you may have one or more of these forms depending on the number of bank accounts you have registered) and General Data Authority Form. This address can be found on the bottom of the General Data Authority form. DO NOT POST THESE FORMS TO YOUR BANK. ANZ customers - please note that, as of 16/10/2015, you will have the ability to register online for ANZ bank feeds for Cashbook. 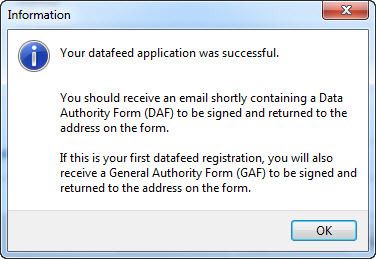 This means that, rather than receiving a Data Authority Form (DAF), you will receive an instruction sheet that explains how to activate your bank feeds. If you experience any difficulties with the online ANZ registration process, please call ANZ and ask for the Internet Banking Solutions Team support. 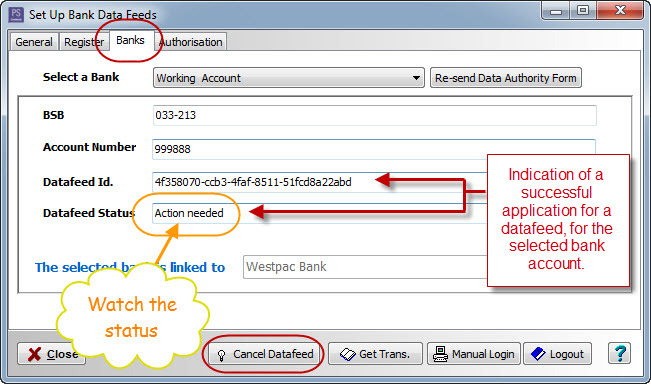 For a succesful datafeed application the Bank window should now have a Datafeed Id. and Datafeed Status. Action needed - indicates that a PDF authority form (DAF) has been generated and needs to be signed and returned. Processing - indicates that a PDF authority form has been received by the operators providing access to your bank data. Active - indicates that the bank datafeed service is now available for you to access. Error - means the bank has rejected setting up the account due to errors with account numbers, signatures, account type, etc. The Cancel Datafeed button will cancel your datafeed application. Get Trans. button - do not click on this button unless instructed by the software or Practical Systems staff. 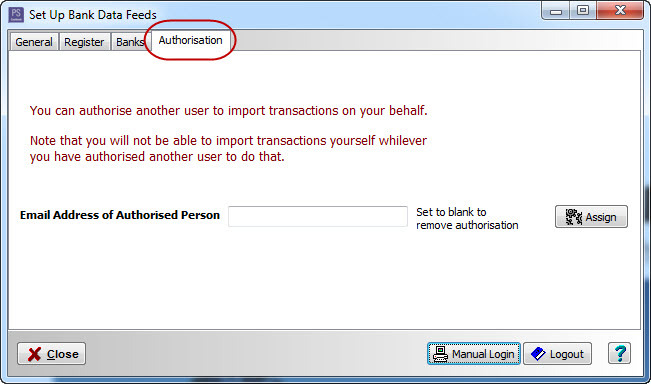 ​This enables the current user registered for Bank Data Feeds to authorise another user to import on their behalf. (eg. 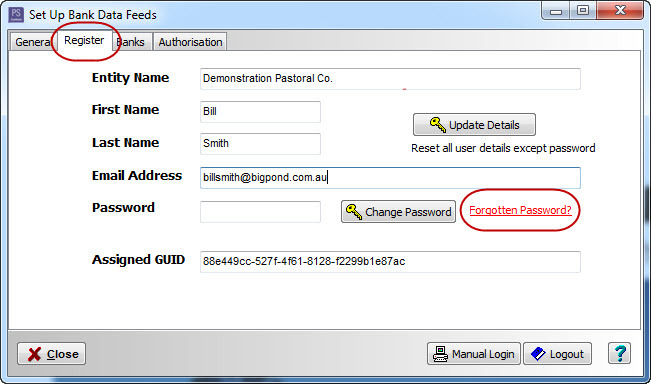 an accountant), Set Email Address of Authorised Person to that person's PS Data Feed registered email address. There can only be one authorised user at a time. You will not be able to import bank transactions until the authorisation has been removed. To return authorisation to yourself, set the Email Address of Authorised Person to blank. 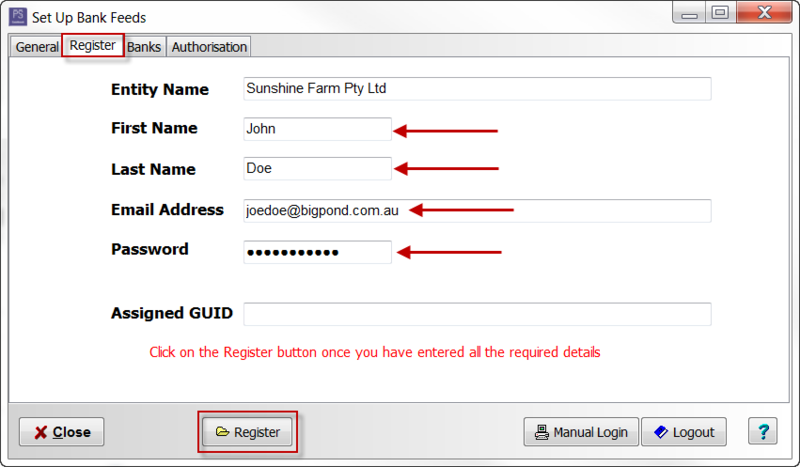 Click on the Assign button to effect the change of authorisation. Once your bank Datafeed Status becomes 'active', you can expect to see imported transactions available in Cashbook. The following link shows you how to process those transactions. 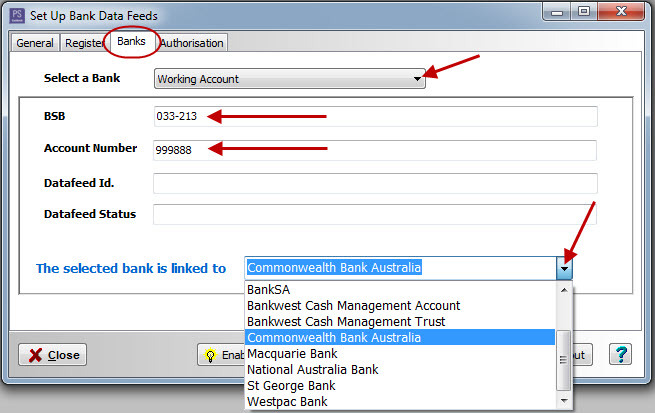 Note: Once you have registered for Data Feed, you can add other bank accounts in exactly the same way as shown above Go to Step 3 - Banks. Bank accounts can be from any of your Cashbook companies. You do not have to register a second time.